Here at Serverless, we've been working hard to deliver some holiday goodies. 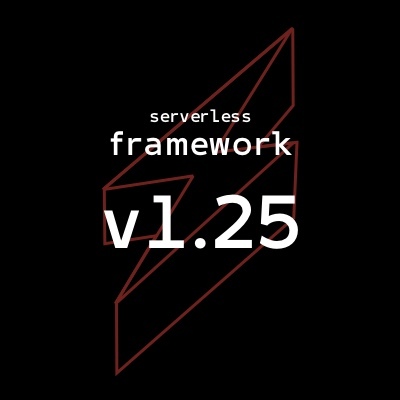 Today we're proud to announce Serverless Framework v1.25. This feature adds S3 Transfer Acceleration support for uploading your deployment packages to S3. Rather than uploading to your region's origin for S3, it uploads the package to CloudFront edge locations and quickly transfers it to S3. Much thanks to Alex Casalboni for adding this feature! AWS recently announced regional endpoints for API Gateway. These endpoints are accessed from the same region where your API Gateway REST API is deployed. This enables a lot of interesting use cases, including multi-region Serverless applications with lower latency or the ability to use AWS WAF with your API Gateway REST APIs. Serverless defaults to an EDGE endpoint, which was the standard before AWS released regional endpoints. For power users of the Framework, the variable resolution could cause some issues. There are a number of bug fixes related to the variable system including support for circular references and a few different PRs to better handle resolving variables that call out to external services like CloudFormation, SSM, or S3. These are huge improvements to the power and stability of the Framework, and they're difficult to implement in a consistent, non-breaking way. We appreciate the hard work of our community members in these fixes, particularly Framework core maintainer Frank Schmid, Benjamin Forster, and long-time user Erik Erikson. Be sure to thank these fine folks for their contributions! This release also includes tons of other improvements and bug fixes. Thank you very much for reporting bugs, opening issues and joining the discussions! We hope that you enjoy this release! Feel free to provide some feedback in our Forum, via Twitter or on GitHub. In addition to the 1.26 milestone and its Issues and PRs, we still have lots and lots of other Issues and PRs. We'd love to implement and introduce these in some of the upcoming releases. Great! We have lots of issues where you could leave some feedback or jump directly into the implementation.